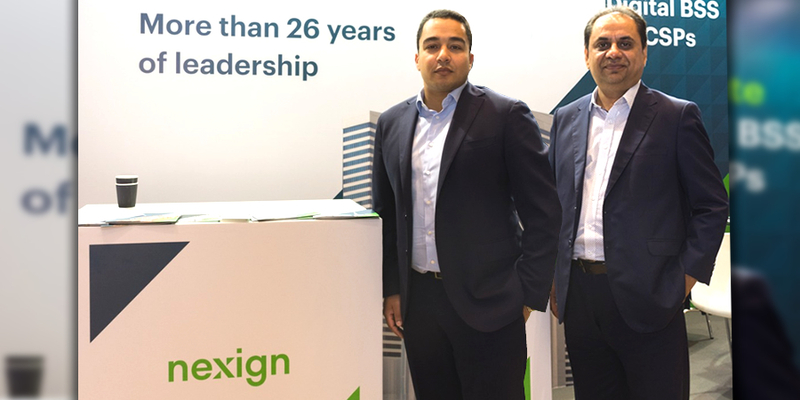 Nexign (formerly Peter-Service), a leading business support system (BSS) provider for communications service providers (CSPs), has announced plans to open the company's Middle East and Africa (MEA) headquarters in Dubai, UAE. Operating as Peter-Service for the past 26 years, Nexign has established a stellar reputation for being a strong and reliable vendor with an unblemished track record of executing successful BSS transformation projects―across all tiers―at a significantly lower total cost of ownership (TCO) than the market average. In fact, to date, the company has completed over 120 projects for 50 major network operators. Telecom Review managed to secure an exclusive interview with Loukas Tzitzis, Chief Products and Marketing Officer at Nexign and Ahmad Sayed, Regional Director for the MEA region at Nexign at Telecoms World Middle East. The two executives have been tasked with spearheading the company's charge into the MEA market -and both boast a wealth of experience and expertise in the telecommunications sector having both enjoyed decorated and distinguished careers in the industry. In a brilliant interview, the charismatic duo eloquently expressed their strategy and ambitious vision for the company's expansion into the MEA market and outlined in detail the rebranding the organization underwent in an effort to better suit its international expansion plans. In addition to this, the two dynamic executives highlighted how the Middle East was a global hub in terms of innovation and that its progressive approach to emerging technologies that is being driven by the UAE government indicated to them that it was the perfect time for Nexign to enter the region as part of its overall objective to provide digital transformation for operators and communication service providers in the Middle East and Africa region. Nexign (formerly Peter-Service) is renowned for being a leading BSS provider in the telecoms sector. Can you explain to us what the decision was behind the organization's rebranding? It was a retrospective decision as well as a forward looking one. Peter-Service is a 26 year-old brand and it is the market incumbent in the region. We're recognized as the dominant provider in BSS solutions for the Russian and CIS market. However, the name doesn't necessarily translate very well when it comes to the international market. The challenges we faced were very literal when it came to the name. We started looking at rebranding approximately fifteen months ago and we came to the conclusion that we needed to undergo a total rebranding of the organization as part of our international expansion strategy. In addition to this, we decided to not even keep the original brand name in local markets. Nexign is now our operating brand globally. How we selected our new name is quite interesting. We engaged with an international marketing agency, but we also started doing a lot of surveys with clients, analysts and partners and there were a number of recurring themes that kept emerging. Clients were complaining that all vendors were the same; they didn't do partnerships and didn't have a digital plan. They said that they were looking for somebody that's going to enable them to take the next step. Operators are looking for that next supplier with the right mentality that has a partnership ethos to work together with vendors on sharing the risk – it's a pay as you grow type of model that is ultimately looking for business model transformation and innovation. That was the feedback we were receiving when we were conducting our research. The last thing that really hit the nail on the head in relation to the name was following a conversation we had with a CTO from a leading tier 1 vendor in Europe – who said they're looking for a sign of commitment. So we started combining all this feedback about being the next partner, the next supplier and the next sign and that's how we created our new brand name – Nexign (pronounced Neck-sine). Can you outline to us what your overall strategy for the MEA region is and why you've chosen now to expand and enter into the MEA market? When we decided to expand, we looked at the fact that we can address all the requirements of our existing clients as we're on very solid financial footing. But we also realized that this would be perfect time to make a play into the international market for a number of reasons. Firstly, if you look at the Middle East, you see a tremendous amount of innovation and we see a combination of cutting-edge innovation together with a requirement to deliver that innovation in very challenging commercial conditions. We're also seeing an agenda that is being driven right at the highest levels of government in terms of innovation around 5G and Internet of Things. We've already been addressing all of these emerging technologies since 2015 and we realized that we could port all of our expertise nicely into this region. We're very conscious of the fact that there are specific cultural matters that are very important when it comes to conducting business in the Middle East. This is a market with long decision cycles and one that requires relationships to be built bottom up and top down. It is a market where you need people that have been here long enough to understand the value chain and know how things work. This is the primary reason we've hired Ahmad Sayed who is a veteran of the Middle East – and he's ex-BT (British Telecoms) so he has global experience. He has been in the region for fifteen years and is the perfect candidate to spearhead our launch into the market – and through the work of Ahmad we have seen a lot of opportunities coming both in terms of the government-driven initiatives to spearhead innovation - but also in relation to operators and communications service providers that are obviously looking for that next step. What differentiates Nexign from other BSS providers in the telco industry? If you had asked me 10 years ago, most of us as vendors used to compete on functionality. The reality is that in order to be successful today you need to compete not only functionally, but more important is the non-functional aspects. By non-functional I mean architecture, flexibility, design and the business model. If you look at any operator, the influence of OTTs has decimated voice revenues and their classical portfolio has started to stagnate. The No.1 question that most operators are asking us – including in the Middle East - is how can you help us offset this type of stagnation? The primary thing we try to enable when we talk about digital transformation - which a lot of people use as a fad – we say it's all about business. How do we help you transform the business model? This actually starts with the services side in terms of the consulting and the value add that you can bring in. We need to map where they need to be from a business perspective and then how do the products and services we offer actually contribute to that. You have a subscriber base that is better informed than ever in the history of telecommunications. Everybody wants exactly what they want when they want customized and tailored to them. So in that respect, personalization becomes absolutely critical. When it comes to personalization and systems, one of the core principles of what we have in the system is what we call analytics-based decision making. These are things like the next-best alternative, next-best offer and personalization down to individual subscribers. I also want to be able to have another partner offering from one of the existing operators partners. This is where the business model transformation comes in because it is around partnership-enablement and the digital economy is really about a partnership ecosystem. For us, business model differentiation which we enable through products, services, personalization and optimal customer experience by going further than the OMNI-channel is what differentiates us from our competitors. At this point in time, when it comes to TCO, all our experiences indicate that we're 25% better off than any of our competitors. I'm not saying we're the cheapest, but when it comes to value for money or price performance, we want to be leaders in value for our clients.